Bloody Marys for Sunday Brunch are a big deal in Lake Charles! And deservedly so. There’s nothing quite like a Bloody Mary to get a weekend morning off to a zesty start. These cocktails have been a popular brunch beverage since the 1960s. Back then, the drink was little more than tomato juice, a shot of vodka, a splash of Worcestershire sauce, a squeeze of lemon, and a few shakes of salt and pepper. Over time, bartenders began adding ingredients like celery sticks and olives. More recently, a Bloody Mary is akin to an appetizer – a salad in a glass, if you will – with garnishes such as pickled green beans and okra, carrot sticks, pearl onions, shrimp, and bacon adorning the drink. Here in Lake Charles, Bloody Mary fans have plenty of options to find their favorite refreshment. For example . . . Chef Lyle Broussard at Jack Daniel’s Bar and Grill, L’Auberge Casino Resort has taken the Bloody Mary concept to a whole new exciting level. 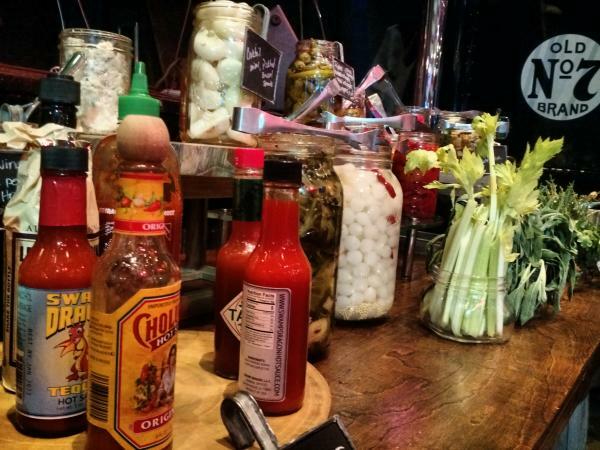 His Bloody Mary bar welcomes patrons to make their own unique over-the-rim concoction. The bartender provides a bottle of baseline Bloody Mary mix – enough for two drinks. Then guests proceed to the Bloody Mary bar where they choose from an impressive spread of 30-40 garnishes, including shrimp and crab claws, pickled eggs, vegetables, lemons and limes, locally sourced beef jerky, a variety of hot sauces, and an assortment of herbs and spices. You can’t go wrong! Brunch is served Sundays 10:30 – 2:00. Bar manager Mike Giles at The Villa makes their Bloody Mary with an intriguing secret blend of tomato products, herbs, spices, and seasonings. Even the spices around the glass rim are a mystery. Garnishes include fresh lemon and lime, queen olives, spicy beans, celery stick, and a slice of crispy pecan wood smoked bacon. Sunday brunch from 11:00 – 2:30. 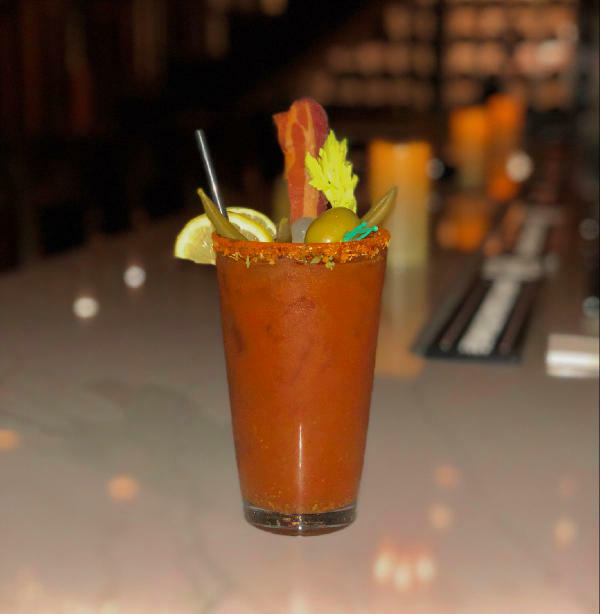 Other brunchtime Bloody Mary options include Luna Bar and Grill, 1910 Restaurant and Wine Bar, Tia Juanita’s Fish Camp, and the Chart House at Golden Nugget Casino Resort.